Our letterpress wedding invitations are absolutely stunning. 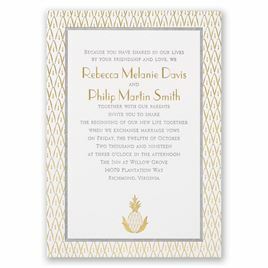 From the luxurious paper to the heavily imprinted design and wording, these invitations are truly works of art. Our team of expert designers developed a collection of gorgeous designs we couldn't be more proud to offer you. Once you have fallen in love with an invitation, you can choose up to two ink colors from the large variety of colors we offer. 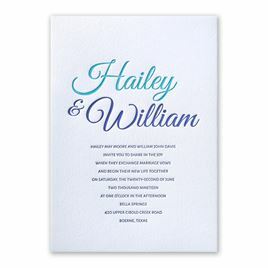 Plus, we include 100% cotton inner and outer envelopes with all letterpress wedding invitations. If you thought it was impossible for an invitation to take your breath away, think again. Shop our entire collection and discover the beauty of letterpress. Take a look at our foil stamped invitations for other classic options. Continue your wedding preparations with wedding table numbers. I absolutely loved all of my samples it is going to be a very hard decision as to what too pick. Thank you very much although the decision will be very difficult. These invitations were a little pricey but were worth every penny. When they arrived they were even more beautiful than the pictures made them appear. Absolutely love this card -- perfect for my wedding reception. Letterpress printing was so pretty!